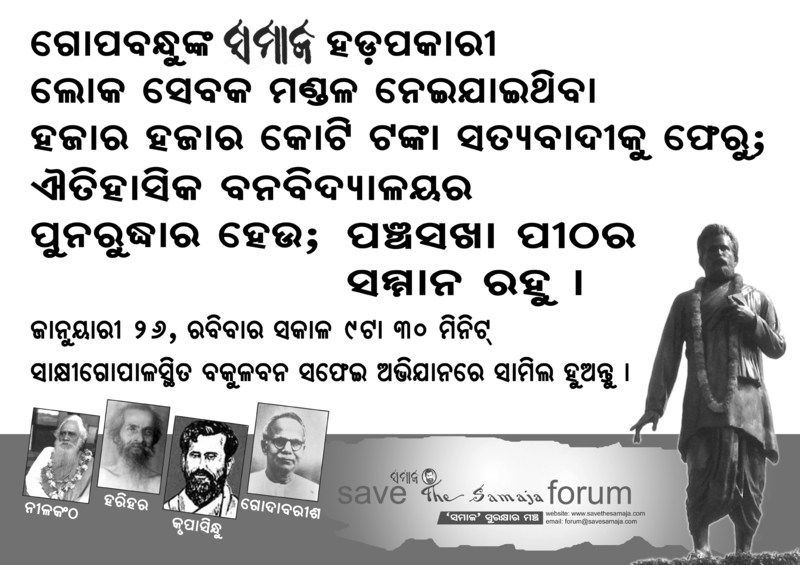 Servants of the People Society has swindled massive money from the revenue generated by the news daily – The Samaja – in total violation of terms and conditions on which alone it had taken over Pandit Gopabandhu Das’s Satyabadi Press. Save The Samaja Forum has been campaigning for stoppage of this illegality. It wants all the thousands of crores of money SoPS has swindled be returned to Orissa to revive the Bana Vidyalaya and to make the expressed wishes of Gopabandhu executed. In commencing its mission for revival of the Bana Vidyalaya, SSF will try to clean the podium and statute of Gopabandhu lying abandoned in the Bakula Bana on the Republic Day, 2014 and has requested everybody to co-operate with the mission.